If you're looking for a sturdy shovel than easily fits in your pack and can move some serious snow without weighing you down, look no further. The ARVA Ovo Light is one of the lightest telescoping shovels on the market, with a shaft that extends to 55 centimeters (21.7 inches) to give you ample leverage when clearing out avy debris. The anondized aluminum blade and an ergonomic off center handle provide excellent digging efficiency while the detachable, collapsable shaft makes the shovel very packable and quick to deploy. Telescoping oval shaft made of aluminum ranges from 41cm to 55cm (16.1 to 21.7 inches). Anodized alumnium blade is 1.5mm thick so it can take a beating. 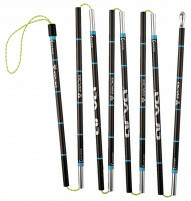 Reversible handle extends away from the shaft to give you good leverage from either side. Holes in the blade can be used for building anchors and other clever riggings. Notes Telescoping blade for packability and extra leverage. Bottom Line Quality lightweight digging machine.